In a saucepan over a medium-low heat, combine the butternut squash, apples, raisins, crystalized ginger, sugar, cornstarch, lemon juice, and cinnamon. Heat gently for 5 minutes, stirring often so it doesn't scorch. Stop cooking once the squash is tender, but before it becomes mushy. Allow the mixture to cool before using to fill your hand pies. 1. Preheat the oven to 425Â°F. 2. Line a sheet pan with parchment paper. 3. 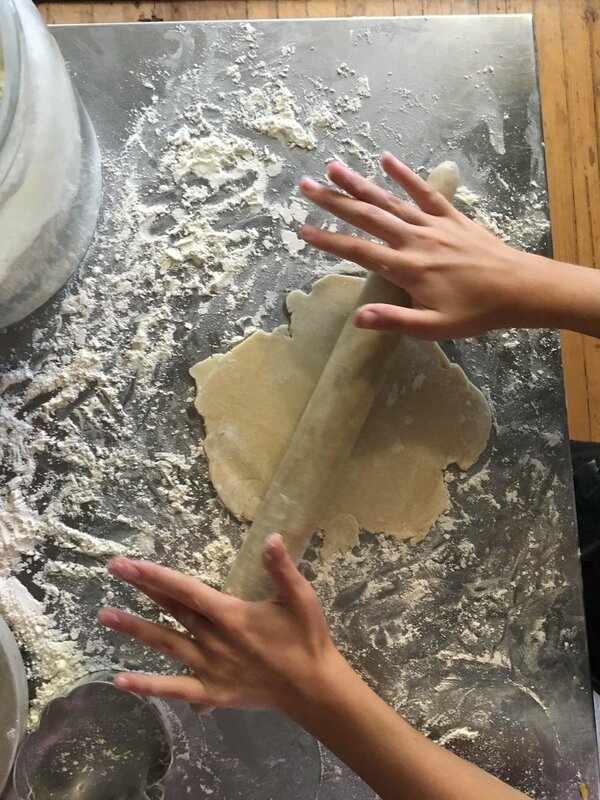 Use a well-floured rolling pin to roll the dough out to â…œ-inches thick on a floured surface. 4. Cut the dough with a pumpkin cookie cutter (we used a 4 inch cutter). 5. Reuse the scraps of dough as necessary to avoid wasting dough. 6. Place the cut shapes into the refrigerator for 15-30 minutes, covered, to chill. 7. Remove the dough from the fridge and, one at a time, brush the edges of each with beaten egg. 8. Spoon 2 heaping teaspoons of the filling onto half of the pumpkin shapes. 9. With a small paring knife, cut out the jack oâ€™lantern faces on the other half of the pumpkin shapes. 11. Brush the outside surface of the pastry with the egg, then sprinkle with the sugar, and bake for 20-25 minutes, or until golden.